"This is an example quote about Synology"
Make Backblaze B2 your Cloud Sync destination on your Synology NAS and save every time you sync. 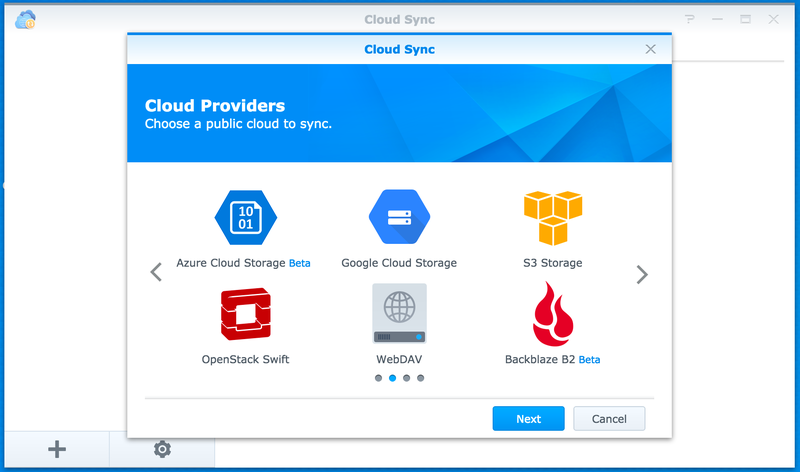 Save up to 75% versus Amazon S3 when you sync your data from your Synology NAS device to the B2 cloud. The first 10GB of B2 Cloud Storage is free. The pricing is simple, no tiers or hidden charges. Set daily expenditure alerts to stay on budget. Choose from 4 levels of support. Sign-in to your B2 account (click here if you don't have one). Identify, or create, the B2 Bucket you wish to use. Locate your B2 Account ID and B2 Application Key. Sign-in to your Synology NAS device. Ensure you are using Cloud Sync 2.1.0 or higher. Select Backblaze B2 as your cloud provider. Enter the B2 Account ID and B2 Application Key. Enter B2 Bucket name identified above. Select the folder on the Synology NAS device you wish to sync. Select "Next", confirm your settings and the sync will start. You pay Backblaze directly for the B2 cloud storage service.